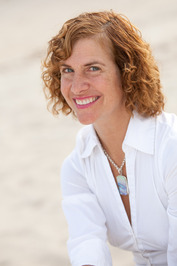 Our next stop for the Romancing YA event, on this blog, is Huntley Fitzpatrick! Today Huntley stopped by to answer a few quick questions for us! 1) What I Thought Was True is your second contemporary romance novel - where did your inspiration for this story come from? After having written MY LIFE NEXT DOOR, where the couple had a romance that came relatively easily and naturally to them (although they had to fight for it later), I started to imagine how it would be if the romance came rather hard. I wanted to explore the idea of two people who really were right for one another getting off to an absolutely wrong start—and see if they could find their way back into love. It’s so easy to get things wrong, and to misinterpret things and always easy to give up there. I wanted to write about persistence, I guess. 2) Can you tell me a bit about the romance between Gwen and Cassidy? At first glass, they are opposites in every way. She’s from a working class family, impatient, feisty and opinionated. He’s from a wealthy local family, easy-going and seemingly self-assured. They knew one another as children—one long-ago summer—and then remet in high school the year before the story takes place. Both of them remember their childhood friendship, and they’re drawn to one another now that they are older. But when they act on their attraction, it’s a bit of a disaster. So the question of the story is whether their love is true…the real thing. 3) How does the romantic dynamics in My Life Next Door differ from that in What I Thought Was True? The dynamics were very different, and I enjoyed writing that difference. One of the best things about writing a romance is figuring out how two very different people will find their way across that difference. Jase and Samantha understood one another on some level, from the start. As Jase says early on, “you know who to trust.” He and Sam had a fundamental connection, sense of ease. That comes much harder to the couple in this book. Gwen is warier, and Cass less confident. But deep down, they are two people who are actually perfect together, whose flaws and strengths compliment one another. and thought to prove that first impression right. As things go on, if you’re lucky, you see each other in different lights all the time, and get to fall in love over and over again. 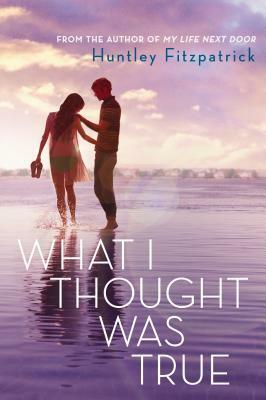 Synopsis: Gwen Castle's Biggest Mistake Ever, Cassidy Somers, is slumming it as a yard boy on her Nantucket-esque island this summer. He's a rich kid from across the bridge in Stony Bay, and she hails from a family of fishermen and housecleaners who keep the island's summer people happy. Gwen worries a life of cleaning houses will be her fate too, but just when it looks like she'll never escape her past—or the island—Gwen's dad gives her some shocking advice. Sparks fly and secret histories unspool as Gwen spends a gorgeous, restless summer struggling to resolve what she thought was true—about the place she lives, the people she loves, and even herself—with what really is. Huntley Fitzpatrick grew up dreamy and distracted in coastal Connecticut, attended Concord Academy and Yale. She flourished in a family of bookworms where everyone always had their nose in a book. She kept an exhaustively thorough journal which frightened her boyfriends but has proved very useful in her career as a writer. Her debut contemporary Romance, MY LIFE NEXT DOOR, was published in June of 2012 by Penguin-Dial for Young Readers. Now she laughs with and eavesdrops on her six children who provide her with perspective and material. She is represented by the amazing Christina Hogrebe of the Jane Rotrosen Agency. Win bookmarks, postcards and a pre-order of What I Thought Was True! My best date was the zoo! It was fun and relaxed and we could laugh and just hang out. The worst was this formal dinner with his parents. It didn't go well because we were all nervous and couldn't talk or laugh about anything. Woah, sounds awesome. April is so far away. I really liked My Life Next Door, and this one has a certain Persuasion vibe and I can't wait to get my hands on. Never been on date yet. Going to have to agree with Angela C. here. Lol. There hasn't been any best or worse. All the dates I've been on have been...fine. I've been out in date type things, but I don't really consider them dates...they makes me feel nervous and awkward. My one and only official date was horrible and ever since them I just consider them hanging out. Does that make sense? My best was with a good friend. My worst, he brought his Mother along. I haven't been on a good date. Haha. But once a guy I went out with "forgot" his wallet and made a big deal out of paying me back. Talk about awkward.